Kevin Corcoran is an experienced business lawyer and litigator who has substantial first chair trial experience from a broad range of litigation matters in state and federal courts. He has represented clients in complex commercial disputes and catastrophic claims in the Oil & Gas, Petrochemical, Retail, Consumer Product, Manufacturing, High Tech & Media, and Trucking Industries. Kevin was recently elected as a member of the nationally acclaimed American Board of Trial Advocates (ABOTA). 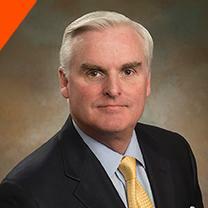 Mr. Corcoran also brings real world management and financial & tax experience to his legal practice from managing two different fast growing privately held companies as Chief Financial Officer, Chief Operating Officer and Chief Legal Officer from 2000-2012. He has presented to and negotiated directly with board members and senior executives from some of the best known companies in the world. He understands, first hand, the challenges to managers and executives of legal matters in the day to day management of their business. As a former senior executive with profit and loss responsibilities from two international companies, and a successful boardroom and courtroom lawyer, Kevin seeks to obtain superior results for his clients while also managing and controlling legal costs. He believes in knowing your company well, protecting its brand and business relationships, and serving as a trusted and efficient advisor to you, the client. Kevin has tried lawsuits for clients in Angleton, Austin, Beaumont, Conroe, Corpus Christi, Galveston, Houston, Lufkin, Orange, and San Antonio, and his state-wide practice includes representing clients in multiple Texas counties, including Cameron, Chambers, Bexar, Dallas, Fort Bend, Frio, Hardeman, Harris, Hidalgo, Jefferson, Montgomery, Nueces, Orange, Palo Pinto, Parker, and Tarrant, as well as Mexico, Australia and Japan. Kevin remains active in professional and community organizations. He was elected to the Galveston County Appraisal District Board in 2016; is an advisory board member of the Institute for Energy Law; is a past President of the Board for Interfaith Caring Ministries, and past board member of Theatre Under The Stars (TUTTS). He is active in local chamber and bar associations. •	Representing partner in a travel center business for breach of contract suits, partnership dispute and tax matters. •	Representing transportation and trucking company in Texas and Mexico in all litigation and tax matters. •	Representing Permian Basin operator and service companies for litigation involving drilling and master service contracts, joint operating agreements, royalty disputes, mineral liens and related matters. •	First chair $3.5 million jury verdict in an executive employment agreement for a Houston chief financial officer. •	Represented business client engaged in the "honey" industry in Galveston federal court and state court in 2014-2015 for breach of contract and claims arising from a class action RICO and anti-dumping lawsuit in Northern District of Illinois. •	As general counsel from 2012 through 2014, managed two outside Houston firms defending litigation in state and federal court involving a multi-million dollar contract claim based on a licensing agreement and obtained a highly favorable settlement. •	Initiated & managed multi-million commercial litigation against Sears in Illinois Federal Court through Chicago outside counsel from 2011 through 2014 and obtained a favorable settlement. •	Defended leading food supply company in Houston for 8 years for truck accidents, warehouse accident and employment cases including multiple death cases that resulted in trials. •	Defended hundreds of premises liability cases in multiple counties, including security shooting death cases which resulted in over 30 trials. •	Defended WR Grace, Grace Drilling, Stan Trans Petrochemical and Hampshire Chemicals. •	Representing a Texas oilfield services company in federal court for litigation involving $40 million in overcharging claims brought by a publically traded E&P company. •	Obtained a dismissal of a WARN Act employment case in federal court after previous counsel had recommended a $1.4 million settlement. •	Representing transportation and trucking company in Texas and Mexico in all corporate, transactional, and international matters. •	Assisted client with Australian joint venture, opening Australian offices, including corporate, employment, insurance and immigration matters. •	Represented Houston CNG conversion company in their 2012 private offering to a Fortune 500 company. •	Represented Houston engineering firm, Analyzer Technologies International, Inc. in their asset sale to EnGlobal (NYSE "ENG"). •	Assisted client with opening UK offices of new UK subsidiary, including corporate, leasing, employment, insurance and immigration matters. •	As Chief Financial, Operating & Legal Officer, managed the turn-around and growth of 200+ employee, $65M annual revenue, international entertainment company specializing in Japanese Anime. Offices: Houston, Tokyo and London. •	Negotiated and drafted over 100 licensing agreements with Japanese and US entertainment companies including Mitsubishi, Pioneer, Bandai, Dentsu, TBS, Kodansha, Toei, Tribune Entertainment and the Jim Henson Company. •	Negotiated and drafted sub-licensing agreements with major US and European entertainment companies including Cartoon Network, Sci Fi Channel, Showtime & Encore in the US and Sky1 TV (UK) and Canal + in France. •	Launched a cable television network for a media company and served as its President. Invited to speak on an industry panel concerning high definition programming at NAPTE and shared the stage with Mark Cuban, owner of HD Net. •	Negotiated and drafted manufacturing agreements with Chinese manufacturers. •	Advised a client receiving almost $200 million in private equity to purchase oil & gas non-working interests.